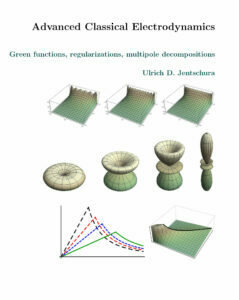 The cover of Dr. Jentschura’s new book on electrodynamics. Quantum electrodynamics is a lot like baking a cake, and then trying to take apart the individual ingredients. At least, that is what physicist Dr. Ulrich Jentschura equates to the process of creating an equation that can couple particles’ and antiparticles’ predicted masses at the same time. With funding from the National Science Foundation, Jentschura and his research team are trying to “take apart” the Dirac equation, which describes particles and antiparticles simultaneously – antiparticles being the corresponding antimatter with the same mass and opposite charge of particles. The magic trick that takes the cake apart is a transformation devised by two other physicists, Foldy and Wouthuysen, in the 1950s. However, this trick had never been applied consistently to Dirac particles within the context of Einstein’s formulation of gravitation. Taking the equation apart, Jentschura and his team were able to show that particles and corresponding antiparticles couple in just the same manner to gravitation – meaning that their inertial and gravitational masses are the same. Provided the Dirac equation holds, particles and antiparticles must have the same mass and the Einstein equivalence principle must hold for antimatter. This realization has fundamental consequences for antimatter experiments currently being done at physics laboratories around the world. Jentschura and his team have previously studied quantum electrodynamic effects in atoms, and obtained theoretical predictions for energy levels in hydrogen and deuterium, for which Jentschura was elected a Fellow of the American Physical Society in 2013. In addition to his research, Jentschura authored a new textbook titled “Advanced Classical Electrodynamics,” which will soon be published by World Scientific Publishing. He says he developed the book based on his experiences with teaching electrodynamics to graduate students. Jentschura earned a Ph.D. in physics from the University of Technology in Dresden, Germany, in 1999. He joined Missouri S&T in 2009 as an assistant professor. He was later named an associate professor in 2013 and full professor in 2015. Prior to joining S&T, Jentschura served as a Heisenberg Fellow at the Max-Planck Institute for Nuclear Physics for several years. He has served as a member of the editorial advisory board of Physical Review for full six-year term and has earned numerous teaching awards while at S&T.